Even if you’re not vegan, this pesto is bursting with summer freshness. Rich, yet light, this savory condiment is perfect for everything from pasta to meat and vegetables. When one of my friends conjured up a version of this pesto to get rid of some ripe avocado, I was curious how it was going to turn out. Turn out it did. Sampling it straight from the jar, I knew I would recreate it myself at some point. That point came when I joined another friend’s BeachBody challenge group. Needing “clean” recipes and having bought a giant spaghetti squash, now was the time for some dairy-free pesto. I’m a huge fan of traditional Genoese pesto. I first made it back in college with my first food processor. For those who haven’t made it, it’s extremely easy. It’s also calorie dense. 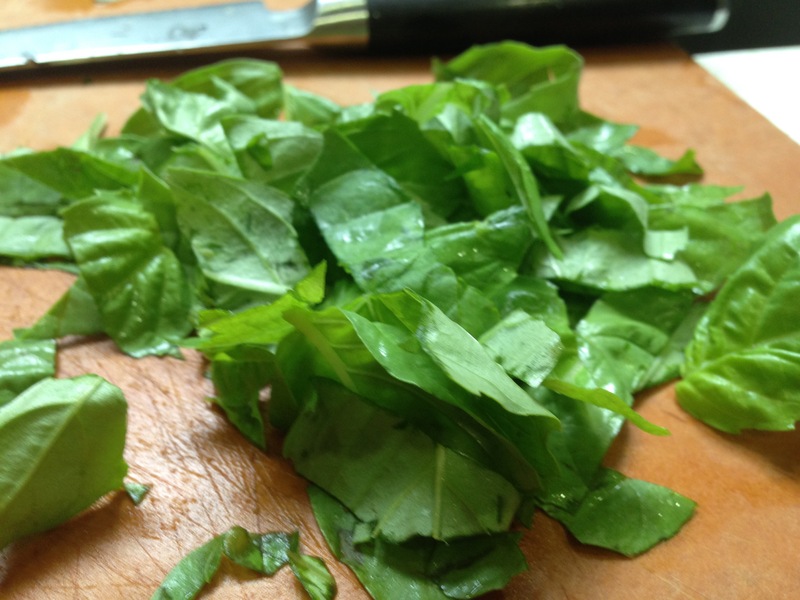 A typical pesto usually involves about 2 cups fresh basil, 4 cloves raw garlic (can we say garlic breath? ), 1/2 cup Parmesan cheese, 1/2 cup olive oil, and 1/4 to 1/2 cup toasted pignoli (pine nuts). That’s a lot of fat – even if most is fairly healthy. 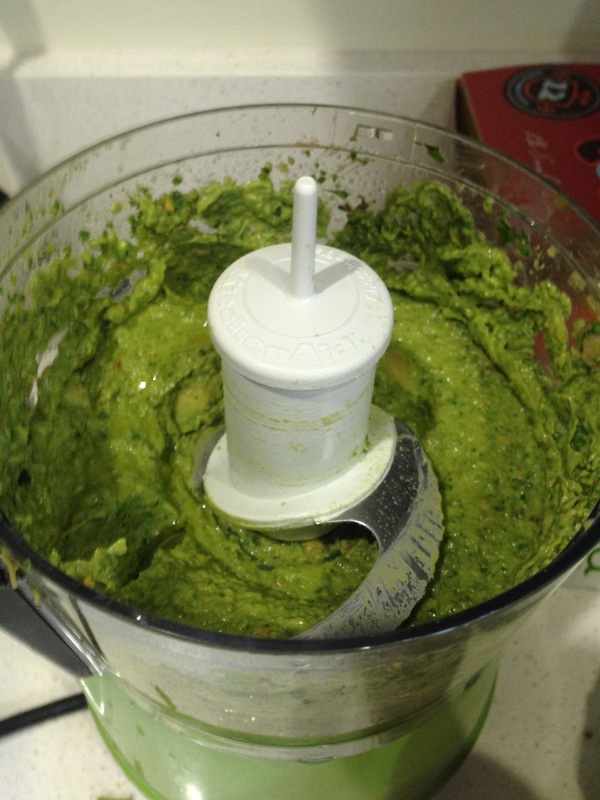 My goal in creating this avocado pesto was to mimic the richness of a traditional pesto but with less oil and calories. I’ll remind everyone up front that this pesto still is not a low calorie food, thanks to the avocado, but fats are healthy and we get a little bit of crunch and fiber from almonds too! The beauty of a pesto is you can tweak it to fit your own preferences. One clove of garlic was enough for the pesto to stand up to meat or roast veggies (or even as a dip – great with plantain chips or sugar snap peas as a snack! ), but you may wish to add more garlic if you plan to make this a standalone accompaniment to pasta or a pasta substitute. 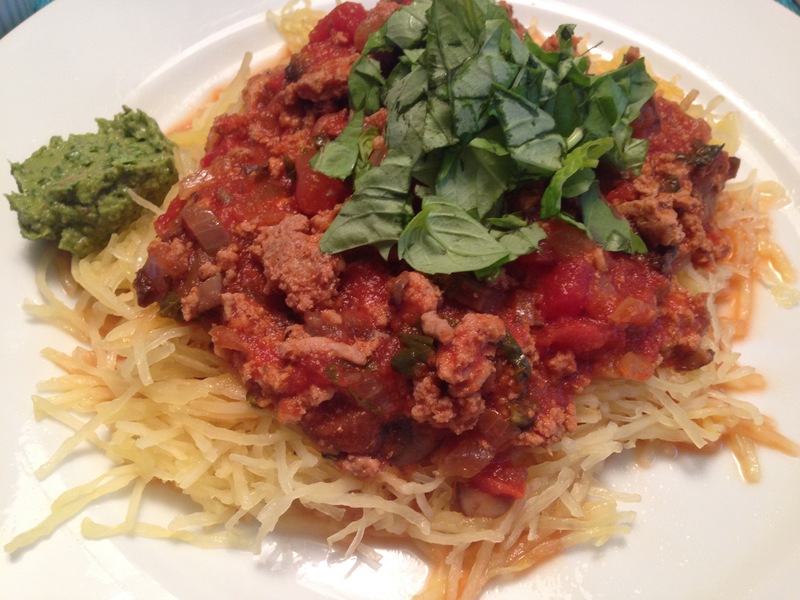 I paired it with my Romanesca meat sauce over spaghetti squash for a bit of yin-yang (meat/veggie). You’ll also want to add the lemon juice gradually; its acidity is needed to preserve the fresh green color of the avocado, but too much and you’ll overpower the basil. Unless, of course, you’re going for basil guacamole! In a food processor, chop almonds until ground. Add the garlic, basil, and avocado. Pulse to mix the ingredients. Slowly add in olive oil; puree the mixture on a high speed setting, adding more olive oil if needed. Add in lemon juice and salt to taste. Blend until smooth. The pesto is ready to serve immediately, but it also can be stored in the refrigerator in an airtight container for up to one week.